In 1702 King William III was thrown to his death in Hampton Court Park when his horse stumbled on a molehill. Thereafter those that supported James II whom William had deposed would toast the health of “the little gentleman in black velvet”.Today many gardeners and landscapers may call them something different! Moles are mainly solitary animals, only happily tolerating each other to mate. They are very territorial, and will defend their ground aggressively on occasion fighting to the death. 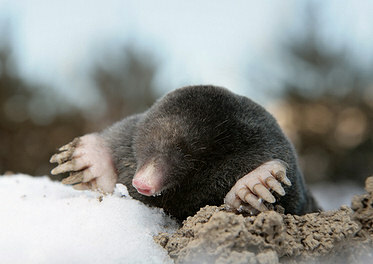 Each mole has its own burrow system, although the territories of several moles may overlap. Moles are active around the clock and throughout the year. They need to eat every few hours or they will starve and in order to supply their need for food which is mainly earthworms and beetle larvae etc that fall into their tunnels they will continually excavate more. Moles are rarely seen although the damage that they can inflict on lawns and borders is all too obvious. In flower beds their underground excavations can undermine plant roots thereby killing the plant. In lawns the piles of earth produced by their tunnelling are unsightly and can make the lawn difficult to maintain. If meadows and pastures have a large number of molehills this effectively reduces the amount of grazing available. If you have a problem with moles in your garden or fields please call us for a free survey and quote.